Hello everyone, I have decided to do a back to school related post today! (Sorry for the reminder to everyone that has school soon). I am going to be doing a few more back to school posts, because personally I like reading them and feeling slightly organised for the up coming school year! 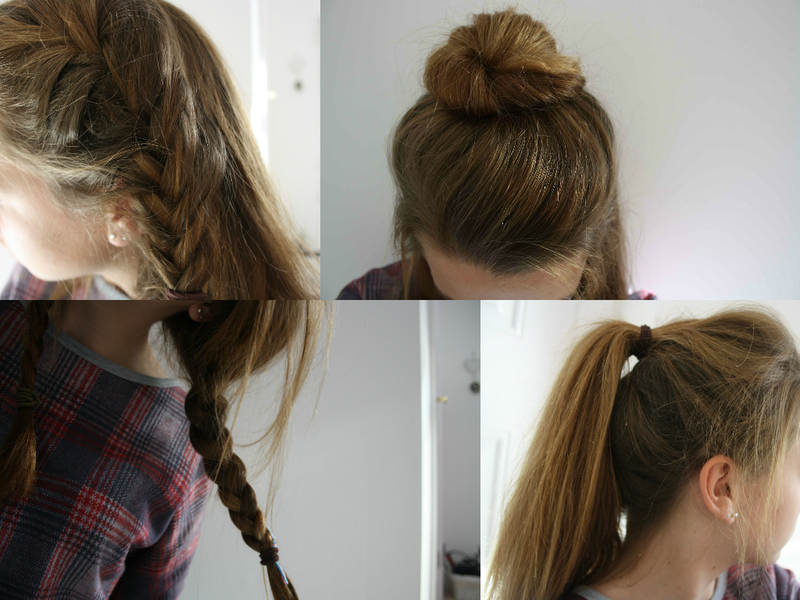 Even if you’ve finished school, or don’t go to school these easy hairstyles will still be suitable for everyday. The first style is what I’d call the ‘half up half down’ look, but with a bun. This is one of the more similar styles, however you do need to play around with it to get it looking exactly how you want. Step One: Take about half of your hair, then with either a brush of your fingers just pull back the front bit of your hair so its flat. Step Two: Start to twist the section of hair you have in your hand so your bun stays in place, then just make a bun shape on the top of your head and secure it with a hairband. (I’m sure everyone knows how to do a bun, but just in case haha). Step Three: If you need to you can add bobby pins to keep it more secure, you can play around to shape it how you like, make it messy, make it neat, whatever you feel! This one is one I’m super excited to show because I kind of made it up! It’s a fish tail/french braid. Step One: Make quite a deep side parting in your hair, then take a small section of your hair at the front. Step Two: Next, with the piece of hair you have in your hand, section it into two pieces, as if you were about to start doing a fishtail braid. Then start to fishtail this section of hair, however, this is where the french braid part comes into it. Whilst fishtail braiding your hair, add small sections of hair into the part you are braiding, just like a french braid. Step Three: I know this sounds so super complicated, but I promise it’s not! It’s just french braiding, but with two sections of hair instead of three, to give it a cool ‘fishtail/french braid’ style. Step Four: Once you reach about your ear just start to do a normal fishtail braid, then tie it off with a hairband. The third one is just a very simple pony tail, however a sort of middle pony tail, not high or low. With a bit of texture at the front. Step One: Take all of your hair, and put it into a pony tail about halfway up your head, so its not a high ponytail nor a low one. Step Two: Now, pull at the hair at the front of your head to give it some volume, if you have your hairband quite tight around your ponytail, the volume should stay for the rest of the day. You can use hairspray, or volumizing spray to make it hold longer too. This is a simple yet really effect one, especially if you want your hair out of your face for school and want to make it look a bit less ‘casual’. So the last hairstyle I will be showing you is just simply two low plaits. I think these can be really cute to wear and are super girly. Step One: Part your hair into two sections and bring them round to the front. Step Two: On either side, start to just do a normal plait, they don’t have to be neat at all, messier the better! Step Three: Once this is done all you need to do it just put a bit of volume to the top half of your hair, the bit thats not plaited. Just use your hands to push your hair up, or use some salt spray thats always really good. You can pull pieces of hair out and just style it how you like! Thankyou for reading, I hope this gave you some ideas for how to have your hair for this next school year.